Porsche 911 GT3 Cup : New edition of the worlds most successful race car. The Porsche 911 GT3 Cup is the most successful race car in the world. Since 1998, 2,395 units of the near standard vehicle for customer sport were produced. The new edition of the 911 GT3 Cup is the motorsports version of the future 911 GT3 and as such is the first race car that is based on the seventh generation of the sports car icon from Zuffenhausen. 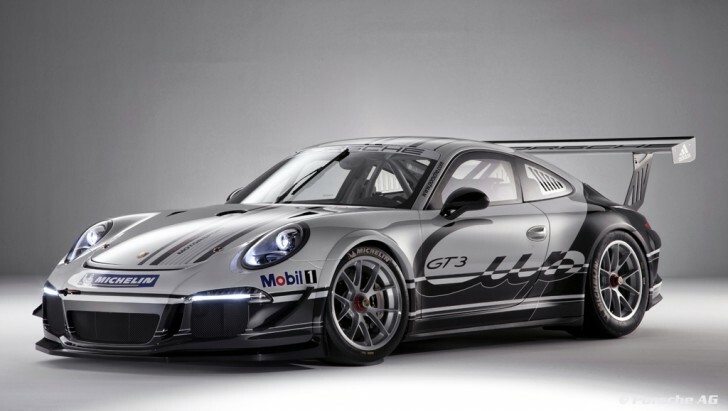 The 911 GT3 Cup will be run exclusively in the Porsche Mobil 1 Supercup in 2013. The car for one-make racing made its debut on the occasion of the end of motorsport season “Night of Champions” celebration at the R&D Centre in Weissach. The new Porsche 911 GT3 Cup is powered by a 3.8-litre six-cylinder flat engine. It generates 460 hp (338 kW) at 7,500 revs, surpassing the predecessor by 10 hp. A six-speed dog-type gearbox developed by Porsche Motorsport which is operated via shift paddles at the steering wheel for the first time in a Porsche brand trophy race car transmits the power to the rear axle. The single piece race wheels with centre mount were also newly designed by Porsche Motorsport. The width of the Michelin race slicks was increased by two centimetres to 27 centimetres at the front and by ten millimetres at the rear axle to now measure 31 centimetres. Like its predecessor the new Porsche 911 GT3 Cup is produced in Stuttgart-Zuffenhausen on the same assembly line as the road legal models. At the Motorsport Centre in Weissach it receives a general set-up for the circuit and is tested by a professional race driver before delivery to the customers. The basic price for the vehicle, which is available exclusively in white, is 181,200 Euro plus the country-specific value added tax.